On Friday’s Grimm, Nick and Hank are put on the trial of a dangerous new wesen who surfaces in Portland (pun intended), and the mystery of the stick and Renard’s haunting continue. Spoilers after the break. The episode starts off in Stillman Park, with something rising up from beneath the grass, and looking mighty impressive before un-woging and revealing himself to be covered in dirt. He then wanders the park until some guy on a phone notices him and calls 911, right before turning into what will be Nick and Hank’s case in the next morning. Before he gets put on the case though, Nick is asleep and having nightmares about that time he got shot and died but the stick brought him back. Then he hears noises from the tunnels where Eve is still feeling weak after touching the stick and getting knocked out by it. Nick is interrupted by Adalind, so he closes the door, unknowingly leaving Eve to suffer another night. Renard’s not having such a great night either, although he’s not having it at his nice new house. First, after putting Diana to sleep, he finds her dolls of himself and Adalind, and then the sword she used to make him kill Bonaparte. Then he gets another visit from Meisner the not necessarily friendly but certainly good humored ghost. After running down the stairs, Renard is haunted by a view of several dead Meisners lying on the floor. He just can’t seem to get a goods night sleep these days. The next morning, Monroe and Rosalee are at the doctor’s office, getting an ultrasound, and get some surprising but not really that surprising news. And Nick and Hank are discussing the stick and how Nick died, when they get called to Stillman park for the murder that happened the night before. Sean, having not slept well is about to ask Adalind about being haunted when she shows up to pick up Diana, but changes his mind. And at the park, Wu lets Nick and Hank know what he’s found out so far, like that the guy looks like he was killed by a wesen, and he was robbed of everything, including his clothes. A scream leads them to a boy who fell into a hole, and helping him get out leads to the discovery of a second body. Back at his apartment/fortress, Diana asks her mom about Meisner and talks about wanting to see him again, before casually mentioning that Eve is down below in the tunnels. Adalind helps her get back up, and then Diana goes down to take a look, but with her glowing purple eyes, that give her an added view. Nick and Hank are at the spice shop trying to find what wesen they’re up against, based on what they learned from the autopsy, and after Monroe and Rosalee show up to share the triplets news, they get back to reading. It turns out he’s “immortal” (air quotes assumed by Monroe), and was worshipped as the Greek god Donysus, the Greek god of partying it up. He surfaces every 7 years and then goes back underground after taking something he can eat for the next 7 years. He had told the waitress at the diner that his last meal was too small because he fell for a pretty face. When Nick shows him the police sketch the waitress helped with, Monroe is sure he knows him from somewhere. The wesen isn’t making the same mistake this time, and sends a drink over to a full figured woman at a bar, who happens to be there with a date who gets very jealous and instead of just asking to try some of that drink goes to challenge him to a fight out back, if he’s willing. A few seconds later, and Mr. Party Animal is back inside with no one to stop him from pursuing his prey, and also buying a round of drinks for everyone there. 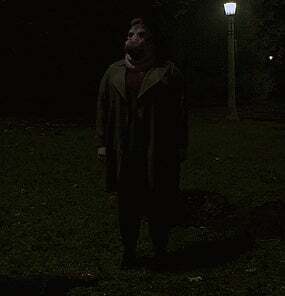 Soon enough, they’re walking through the same park he rose out of the ground from. And he seems to know a lot of the history of the park and Portland in general, what with being immortal and probably having lived through it. And that’s around when Monroe figures out where he’s seen the guy. It’s not that he knows him personally, but that everyone in Portland knows him. It turns out he’s the William Stillman, who the park is named after. And he founded it and kept it funded so he could use it for feeding on his victims every 7 years to keep his immortality. Monroe Facetimes Nick so he can let him know, after he and Hank have arrived at the bar after the jealous date was found dead with a punctured throat. They all figure out he’s going to take the woman he left with back to the park because it’s his park and that’s what he set it up for. There’s even a statue of him. As they race to the park, Renard has called on someone to help him find out if his visions of Meisner are in his head, or an actual haunting. As a way of getting his shirt off, his friend has him take off his clothes and step into a machine that will pull out any ghosts that are haunting him if it’s real, or do nothing if it’s in his head. But first he has to pay with his father’s ring, passed down the family line, and his fake engagement ring. At the park he created, Stillman knocks out his date, and is ready to take her underground when Nick, Hank, and Wu show up, and pretty much get their asses kicked. Then, in a delightfully surprising twist, his date reveals herself to also be a wesen when she woges and bites his head off. Thankfully, someone uploaded this great moment to Youtube. After thanking the would be victim for saving them, Nick and company have another case closed. And ponder their latest wesen encounter while looking at his statue. Back at the pawn shop, Renard learns he really is being haunted, and that it’s not anywhere near over for him. It was closed down the whole time! Anyone else think the wesen looked kind of like a Grimm version of Kamen Rider? I’d really like to see what would happen if Diana picks up the stick. Maybe she’s destined to be its true master and will be able to use it without being affected by it. I think maybe Nick should tell Adalind about the stick. I think at this point, he can trust her. And I get the feeling if Renard tried to pick it up, he’d get hit harder than Eve was. I was hoping Wu would wolf out against Stillman, but his intended victim turning out to be a wesen and one that could easily dispose of him was better. Can’t wait to see what happens with Renard and ghost-Meisner next!